This most interesting and unusual surname is a variant of 'Abbs, itself a nickname patronymic form of the popular 'Abel' introduced by returning Crusaders from the Holy Land. 'Abel' itself derives from the Hebrew given name 'Hevel' meaning 'breath or vigour'. The personal name 'Abel' (Hevel) was borne by the son of Adam, who was murdered by his brother Cain. It was very popular as a given name in Christendom during the Middle Ages, when there was a cult of 'suffering innocence' which Abel represented. For reasons unclear the surname in its very earliest recordings was widespread in Yorkshire and East Anglia, and was well represented in its various forms in the registers of the area. 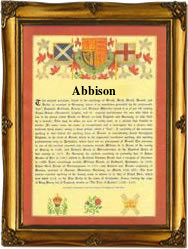 The surname is now recorded as Abbs, Abbis, Abbiss, Abbys, Abbes, Abson, Abbison etc, and all spellings are considered to be patronymic - Son of Abb. Examples of the surname recordings include William Abison, the son of William, christened at St James church, Clerkenwell, on November 14th 1641. Another example is that of George Abbison, a witness at St Pauls church, Covent Garden, London, on May 26th 1706, and William Abson, who married Mary Downes at St George's Chapel, Mayfair, London, on May 1st 1750. The coat of arms most associated with the name was granted in Norfolk, and has the blazon of a red field, a fesse lozengy between three silver escallops, the latter being the sign of the pilgrim, or possibly a crusader. The crest is an iron spur proper. The first recorded spelling of the family name is shown to be that of Willelmus Abson, which was dated 1379, in the Poll Tax rolls of the county of Yorkshire, during the reign of King Richard 11, known as "Richard of Bordeaux", 1377 - 1399. Surnames became necessary when governments introduced personal taxation. In England this was known as Poll Tax. Throughout the centuries, surnames in every country have continued to "develop" often leading to astonishing variants of the original spelling.